Richard Scarry's Mr. Fixit's Mixed-Up Christmas! : A Pop-Up Book with Flaps and Pull-Tabs on All Sides! Richard Scarry's Mr. Frumble's Biggest Hat Flap Book Ever! Richard Scarry's Busiest Busytown Ever! Richard Scarry's Longest Counting Parade Ever! Richard Scarry's 1942 book The Animals of Farmer Jones now appears as a paper-over-board Big Little Golden Book. 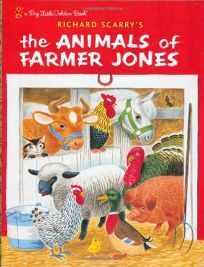 This classic introduction to farm animals spotlights their familiar barnyard noises, impatient appetites and the kind of food they finally do eat. Scarry's lovingly pastoral scenes add to the overall retro charm.